Start off your visit on the 7th (Sun): enjoy the sand and surf at Children's Pool. 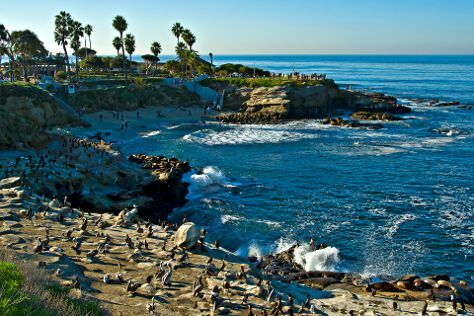 On your second day here, examine the collection at USS Midway Museum and then enjoy the sand and surf at La Jolla Cove. London, UK to San Diego is an approximately 14-hour flight. You can also do a combination of flight and train. The time zone difference when traveling from London to San Diego is minus 8 hours. Traveling from London in July, you can expect nighttime temperatures to be somewhat warmer in San Diego, with lows of 23°C. Finish your sightseeing early on the 9th (Tue) to allow enough time to travel to Carmel. Carmel-by-the-Sea, often simply called Carmel, is a city in Monterey County, California, United States, founded in 1902 and incorporated on October 31, 1916. 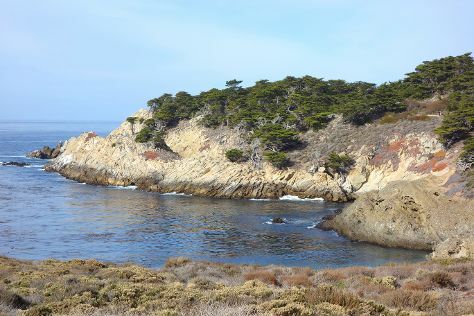 Kick off your visit on the 10th (Wed): hike along Scenic Road Walkway, admire the majestic nature at Point Lobos, and then get to know the fascinating history of Pacific Grove Oceanview Boulevard. Inspirock's itinerary builder makes planning a Carmel trip simple and quick. Traveling by flight from San Diego to Carmel takes 4 hours. Alternatively, you can do a combination of flight and shuttle; or drive. Expect slightly colder temperatures when traveling from San Diego in July; daily highs in Carmel reach 24°C and lows reach 15°C. Finish up your sightseeing early on the 10th (Wed) so you can go by car to Yosemite National Park. 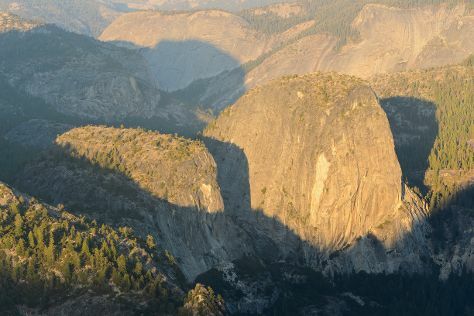 Take a break from the city and head to Taft Point and Glacier Point. There's still lots to do: hike along Tuolumne Meadows, stroll through Nevada Falls Loop, take in the awesome beauty at Cathedral Beach Picnic Area, and explore the striking landscape at Lembert Dome. For other places to visit, photos, ratings, and other tourist information, read our Yosemite National Park online vacation planner . Traveling by car from Carmel to Yosemite National Park takes 5 hours. Alternatively, you can do a combination of flight and car; or do a combination of shuttle, flight, and car. Traveling from Carmel in July, you will find days in Yosemite National Park are somewhat warmer (33°C), and nights are slightly colder (9°C). Finish your sightseeing early on the 15th (Mon) so you can drive to San Francisco. Escape the urban bustle at Alcatraz Island and Twin Peaks. Give yourself a bit of retail therapy at Union Square and Ferry Building Marketplace. There's lots more to do: take in the waterfront at Fisherman's Wharf, make a trip to Golden Gate Park, steep yourself in history at SS Jeremiah O'Brien, and examine the collection at Exploratorium. To find other places to visit, ratings, where to stay, and other tourist information, refer to the San Francisco road trip planning tool . Traveling by car from Yosemite National Park to San Francisco takes 4 hours. Alternatively, you can do a combination of car and flight; or do a combination of bus and flight. Traveling from Yosemite National Park in July, expect nights in San Francisco to be a bit warmer, around 16°C, while days are little chillier, around 26°C. Cap off your sightseeing on the 19th (Fri) early enough to go by car to St. Helena. Start off your visit on the 20th (Sat): do a tasting at Pride Mountain Vineyards, do a tasting at V. Sattui Winery, learn about winemaking at Far Niente Winery, then do a tasting at Anderson's Conn Valley Vineyards, and finally learn about winemaking at B Cellars Vineyards and Winery. Keep things going the next day: awaken your taste buds at some of the top wineries in the area. To find reviews, where to stay, and more tourist information, read St. Helena trip itinerary site . Drive from San Francisco to St. Helena in 1.5 hours. Alternatively, you can do a combination of subway and bus; or take a bus. Expect a bit warmer weather when traveling from San Francisco in July: highs in St. Helena hover around 34°C, while lows dip to 13°C. Finish your sightseeing early on the 21st (Sun) so you can travel to Cannon Beach. Cannon Beach is a city in Clatsop County, Oregon, United States. Kick off your visit on the 22nd (Mon): take in the dramatic natural features at Haystack Rock, immerse yourself in nature at Hug Point State Park, and then immerse yourself in nature at Ecola State Park. On the 23rd (Tue), you'll have a packed day of sightseeing: tour the pleasant surroundings at Cannon Beach, then admire the majestic nature at Oswald West State Park, and then admire the majestic nature at Oswald West State Park. For other places to visit, more things to do, reviews, and other tourist information, use the Cannon Beach road trip planning tool . You can do a combination of flight and bus from St. Helena to Cannon Beach in 6.5 hours. Other options are to drive; or take a bus. When traveling from St. Helena in July, plan for slightly colder days and about the same nights in Cannon Beach: temperatures range from 24°C by day to 15°C at night. Wrap up your sightseeing on the 23rd (Tue) to allow time to drive to Seattle. Shop till you drop at Chihuly Garden and Glass and Glasshouse Studio. We've included these beaches for you: Alki Beach and Seahurst Beach Park. And it doesn't end there: wander the streets of Pike Place Market, examine the collection at The Museum of Flight, let your taste buds guide you at a local gastronomic tour, and shop like a local with Pioneer Square. To see reviews, more things to do, maps, and other tourist information, go to the Seattle tour planner. You can drive from Cannon Beach to Seattle in 4.5 hours. Other options are to do a combination of bus and flight; or take a bus. Traveling from Cannon Beach in July, expect nights in Seattle to be about the same, around 18°C, while days are a bit warmer, around 30°C. Wrap up your sightseeing by early afternoon on the 27th (Sat) to allow enough time to travel back home.